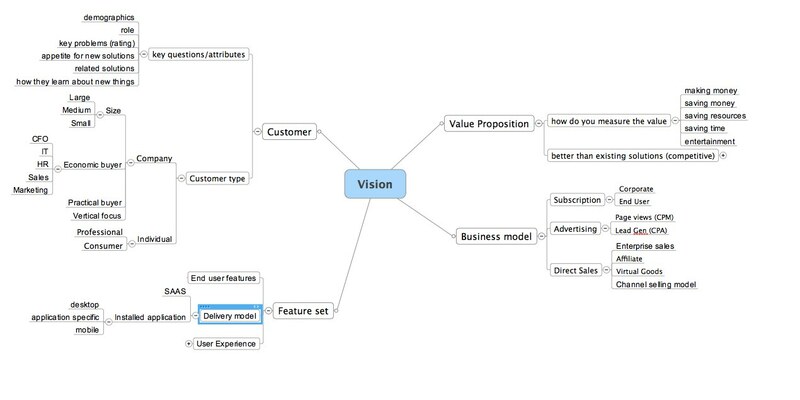 The quick startup – done with a mind map | Thinking, learning and just interested…. We are well into the Techstars Seattle season and I have been spending lots of time with many of the teams. As part of our discussions, we have been talking about how to simplify the pitches as well as capture all the different ideas and put them into context. One good way I have used to do this is with a mind map. I use Mindjet Mindmanager, but you could use others. Here is a template that I have developed that focuses on what I believe are the core elements of any startup – Customer, Value Proposition, Feature Set and Business model. In a perfect world, each of these concepts relates to each other in a cohesive story. For example, if your value is saving someone time, are you charing them more for features that save more time, are you communicating that your features save them more time than the competition, does your customer have a way to quantify time saved, is it meaningful and are you thinking the features you choose by how much time they might save the end user…you get the picture. Here is the simplified, expanded version of the mind map. and the MindJet template you can use. Do more (companies) faster! (thx Brad Feld). 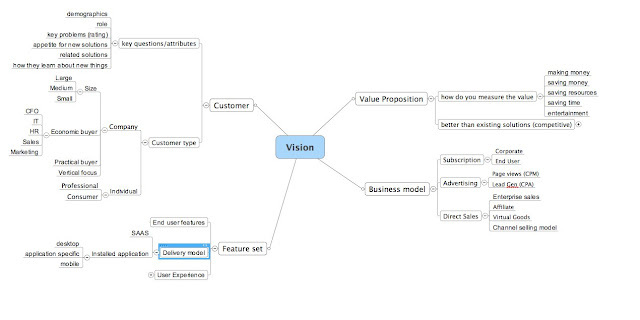 I have also used http://www.mindmeister.com/ which is pretty good if you want to collaborate with others. I actually speculate precisely why you called this particular post, “The quick startup – done with a mind map”.